The smart display market for automotive applications is evolving at a rapid rate. The market is dependent on the demand trends in the automobile industry, buyer’s preferences, technological advancement in digital automotive cockpit electronics, and the progress toward developing autonomous vehicles. Smart displays in automotive applications play an important role in making important driver assistance functions available at a single-touchscreen platform. There is a growing demand for enhanced safety, convenience, and comfort in automobiles, especially in developed economies. Advanced infotainment systems, gesture control systems, telematics, steering-mounted controls, heads-up displays, and central controllers are increasingly being used in passenger vehicles for comfort, luxury, safety, and security benefits. Governments in various countries across the globe are implementing regulations about vehicle safety and security. This has spurred the demand for automotive electronic devices across the globe. Stakeholders across the automobile value chain acknowledge the importance of in-vehicle smart display applications. Automotive display system manufacturers and automotive display panel manufacturers are upgrading their offerings to meet the growing consumer demand for enhanced display applications. These manufacturers are also increasing their R&D spend, to develop improved display technologies that will meet the expanding connected car features. Consumer awareness has played a key role in making smart displays for automotive applications popular. However, the market for these advanced applications and technologies is large in developed countries such as the US, Japan, Germany, and the UK. Economically and technologically advanced nations tend to have an established market for these systems across light-duty and heavy-duty vehicles. Growing economies, such as India and China that are major automotive hubs, have an increasing demand for premium passenger cars. OEMs in these countries are adopting in-vehicle advanced display applications in economic and mid-size vehicles which will push the smart display market for automotive to grow in the next five years. The aforementioned applications play a major role in engaging passengers and assisting the driver. Today, a passenger car is allowed for day-to-day activities such as scheduling appointments, in-car payment services, on-road entertainment, various connected services, and more. that can be accomplished from inside a car. For instance, smartphones can now be connected to the in-vehicle infotainment system. This integration of the phone function with the in-vehicle infotainment system allows for making calls and other smart activities using the in-vehicle touchscreen infotainment display. Vehicles are also equipped with different indicators, such as tire pressure, engine heat indicators, and others. These features are shown on advanced instrument cluster and central consoles. Integration of such features increases the number of information displays and control systems in a vehicle. The rapid increase in the number of vehicles on the roads has led to traffic congestion, leading to many people spending more time inside their vehicles. The increase of time spent inside a car has led to consumers’ valuing in-car connected features. Connected cars provide audio and visual entertainment in the form of infotainment units and enhance the driver’s experience by providing convenience and safety features, such as navigation, real-time traffic, and parking space updates. Industry trends indicate that by 2030, the majority of the cars will have vehicle-to-vehicle connectivity and vehicle-to-infrastructure connectivity that will ensure better road and passenger safety, and reduced congestion on roads. The increase in the demand for connected car solutions is expected to drive the smart display market for automotive. An increasing number of OEMs are offering advanced display applications in economic and mid-segment vehicle variants. However, the cost of equipping a vehicle with these advanced applications impacts the overall cost of the vehicle. The challenge for OEMs is to lower the cost of advanced automotive electronics to reduce its impact on the overall cost of the vehicle. For cost-sensitive markets such as India and China, consumers purchasing economic and mid-segment vehicles prefer to purchase a vehicle with no extra costs attached for additional features. Hence, in automotive hubs, such as India and China, the smart display market for automotive is primarily driven by the demand for luxury vehicles with premium features. Although the prices of these display applications have decreased in the past years due to a significant demand for these systems from luxury automakers, the prices remain comparatively higher than the conventional display applications offered in the economic segment of vehicles. To make advanced automotive display applications a basic feature in passenger cars, the price of these technologies must considerably reduce. Over two decades ago, basic automotive electronics components, such as instrument cluster (analogue & analogue + digital), entry-level information display, basic infotainment unit, basic telematics, and others, were equipped with basic monochrome LCD panels. With advancements in technology and electronics inside a vehicle, more vehicle functions have been integrated into display applications. Advanced display applications for the last decades were equipped with LCD and TFT-LCD display panels. While the basic centre stack touchscreen display, instrument cluster, and rear seat entertainment touchscreen display are equipped with LCD panels, the more advanced applications are equipped with TFT-LCD due to their enhanced visual quality and appeal. Both these technologies meet the stringent automotive application requirements. Since automotive display applications provide advanced functions and come at an added cost to the overall price of the vehicle, it is highly important for display panel manufacturers to meet the ideal temperature and durability requirement in automotive applications. Advanced technologies such as LED, OLED, and AMOLED are often not preferred for automotive display applications since these technologies cannot withstand the high-temperature requirements and hence, are not as durable as LCD and TFT-LCD display panels. However, advanced display technologies provide a freedom of design and heighten the automotive interior aesthetics. Rising demand for electric vehicles and progress toward autonomous vehicles will increase the demand for advanced technologies in automotive display applications. Innovative automotive electronic modules with advanced displays are being incorporated by the OEMs to deliver new and unique user experiences to differentiate their brand image. Display panels are increasingly compatible with connected car operating systems, such as QNX software systems, advanced ccOS (connected car operating system by Hyundai Motor), and others. An intelligent car comprises features, such as self-braking, advanced cruise control, self-parking, and more. 3–5”: 3–5” automotive smart displays are used in applications, such as smart rear view mirrors, small digital instrument clusters, rear seat entertainment touchscreen units, and centre stack displays. 3–5” automotive smart displays are primarily used in mid-size passenger cars with standard automotive electronic features. The 3–5” display size is comparatively used less in advanced instrument cluster applications with 3D displays. However, with developing applications, such as smart rear view mirrors, this display size range will see an increase in smaller display applications. 6–10”: The 6–10” automotive smart displays are used for applications, such as centre stack touchscreen displays, advanced instrument clusters, and rear seat entertainment touchscreen units. These applications integrate telecommunications and informatics technologies and make them available on single-touchscreen displays of 6–10”. Advanced instrument cluster models that incorporate 3D graphics, and various controls and alerts available at a single point are offered at a starting of 7” display size. 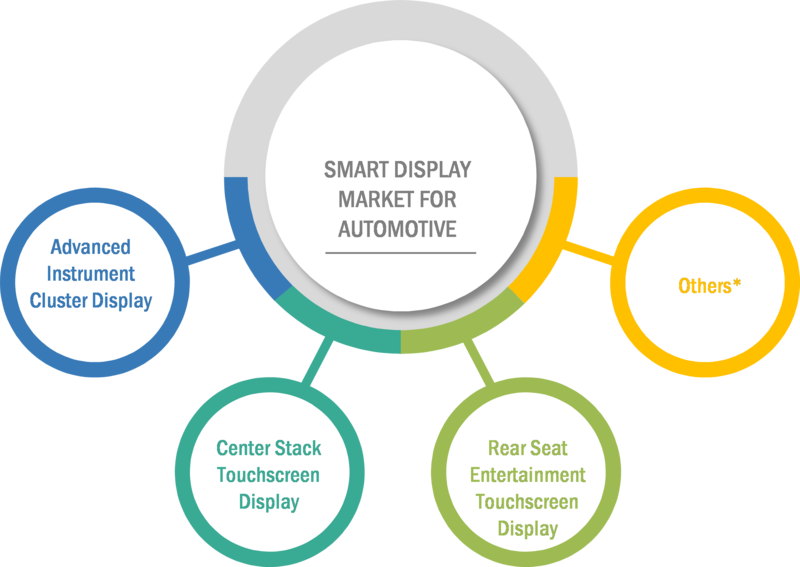 Greater than 10”: The greater than 10” segment of the smart display market for automotive is largely driven by display applications in premium cars, semi-autonomous and autonomous cars, and electric vehicles. The number of semi-autonomous and autonomous cars and electric vehicles will increase over the next decade. This increase in car numbers will drive the demand for larger than 10” automotive displays. The greater than 10” automotive displays in electric vehicles integrate every electronic function into one display application. These displays make available even climate control, suspension settings, and other driver-controlled functions at the touch of a screen.